Pyramid sets are a fun way to breathe new life into your workout routine. Without changing any of your exercises, you can use pyramid sets to shock your body and progress your training. The term “pyramid set” typically refers to multiple sets of an exercise (or exercises) with descending or ascending numbers of reps in concurrent sets. For example, you might only do 1 rep on the first set, then do 2 on the second all the way up to ten. Then you can start working your way down, like going up and down the steps of a pyramid. This type of pyramid protocol can become a serious endurance challenge after a few sets. It’s also a way to make a game out of building up your conditioning. Changing the number of reps not only mixes it up for you mentally, it also keeps your body guessing. But don’t forget, working out is serious business – it ain’t a game! Pyramid sets are commonly seen in weight training as well. In this context, one will usually increase the weight as the reps decrease. In the weight room you might do your first set of squats with 95 lbs. for 10 reps, then 135 lbs. for 8, followed by 185 for 6, etc. This is a great way to build strength and size. 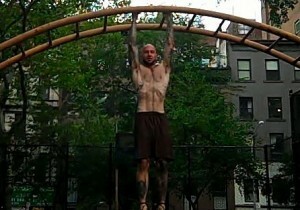 Check out this video of me trying a pyramid workout that I got from my friends The Bar-barians. The pyramid goes from 1-5 reps with pull-ups, muscle-ups and dips. Boy were my arms tired! The standard pull-up is performed while hanging from an overhead bar with your hands a bit wider than your shoulders and your palms facing away from you. Keeping your whole body tight, begin to pull yourself upward. When your chin passes the bar, you’ve completed one repetition. The chin-up is the most common pull-up variation; it’s the same as a pull-up except your palms are facing towards you. Changing the grip from overhand to underhand places more emphasis on the biceps. Feel free to vary the width of your grip with chin-ups and pull-ups. Wider grips will generally be a bit harder as they place more emphasis on the lats; a closer grip puts more emphasis on the arms, chest and shoulders. You can also do a pull-up with your palms facing towards each other. 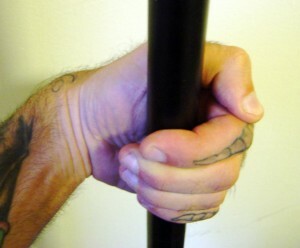 This is typically done on two bars that are parallel to each other (commonly referred to as a neutral grip). There is also a variation where you do a neutral grip pull-up on one bar with your hands staggered, alternating which side of the bar your head passes on the way up. 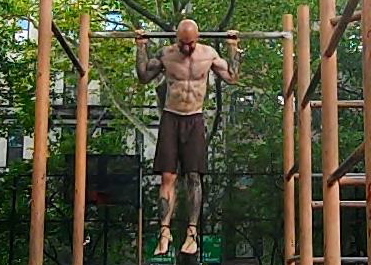 This is often called a commando pull-up. If you’re still learning to do a pull-up, the Australian pull-up is a great way to work your way up. Check out my guide to Australian pull-ups for more on this modification. This is an exercise that I recommend being careful with. If you’re new to pull-ups or you’ve had shoulder/rotator cuff issues, it might be best to leave these out for now. However, for those of you who are comfortable with pull-ups and have healthy shoulders, going behind the neck can be a challenging and worthwhile variation. When performing pull-ups, you want to use a full range of motion. The dead hang pull-up ensures that you are doing just that. During a dead hang pull-up, your arms are fully extended at the bottom of each rep, bringing your body to a dead hang. Absolutely no momentum is used to pull your body upwards. Unlike the dead hang pull-up, when you do a kipping pull-up you are intentionally using as much momentum as possible to swing yourself over the bar – be explosive! There are a few different kipping techniques out there. Mine is a bit unorthodox but it works for me. 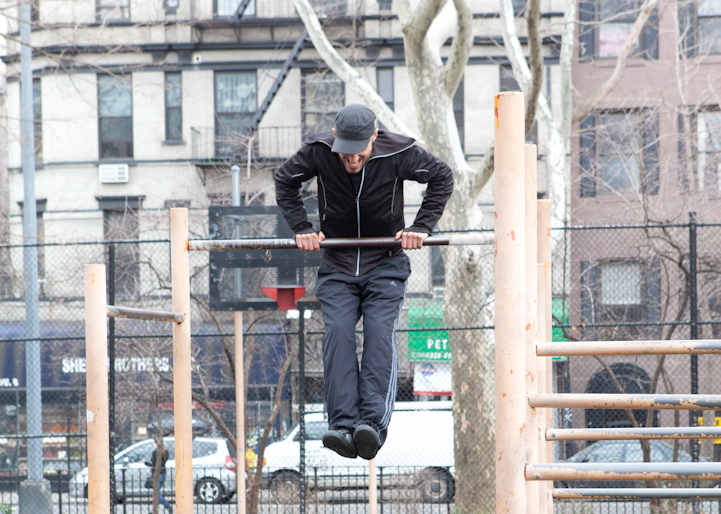 Once you get comfortable with pull-ups and kipping pull-ups, try some plyometric variations. 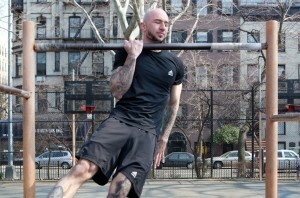 Any explosive pull-up that involves letting go of the bar is a plyometric pull-up. 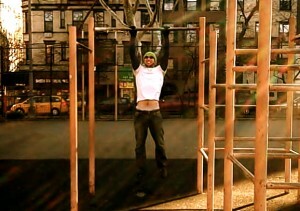 One of my favorite plyo pull-ups is the clapping pull-up. An archer pull-up involves using a very wide grip and only bending one elbow as you pull yourself up. The other arm stays straight. The top of the rep looks almost like you are drawing a bow and arrow. The archer pull-up is a great technique to help practice towards the one arm pull-up. The one arm pull-up is the granddaddy of them all! It takes tons of practice and patience to acquire this skill, but if you are willing to work for it, it’s within your grasp! Yes, the muscle-up is a fairly advanced exercise by itself, but with practice, muscle-ups will eventually become manageable. That’s when it’s time to raise the bar! A muscle-over takes the plyo muscle-up to the next level. Instead of just getting a little hang time at the top, a muscle-over involves throwing your entire body over the bar. This is typically done by bouncing your hips off the bar at the top to get a little extra momentum (sometimes referred to as “casting off”). Psychologically, the muscle-over can be quite intimidating at first, but do not let your fear stop you from trying. If you can do a muscle-up and a vault, you can do a muscle-over. Unlike the pull-up, which is typically easier with an underhand grip, performing a muscle-up with your palms facing towards you is much harder than with your palms facing away. In order to perform a reverse grip muscle-up, you need to generate a lot of explosive power by kipping from your hips and creating a large arc with your body as it moves over the bar. Since you can’t use a false grip when your palms are facing you, allow your palms to spin around the bar on the way up. The circle muscle-up begins like an archer pull-up. Once you get your chin over the bar, begin bending your straight arm and shifting your weight to the other side as you press your body all the way to the top. This move takes a lot of practice but if you are willing to put in the work, it is attainable. Performing any of these moves requires strength, skill and grace. They’re all still works in progress for me. If you’ve read this far and you don’t know about the Bar-barians, check them out. I made up some of these names for moves but I didn’t make up the moves themselves. 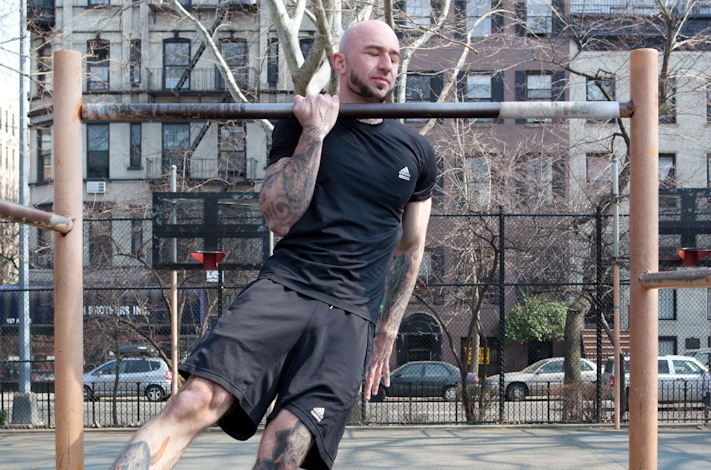 Make sure you’re comfortable with how to do a muscle-up before trying these advanced progressions. Last year, I posted a muscle-up tutorial that explained how to perform the muscle-up on a pull-up bar. Since then, several people have inquired about learning to perform this skill on gymnastics rings. Performing muscle-ups on rings may at first seem a lot harder to someone who is used to doing the exercise on a bar, but once one acclimates to the subtle differences in technique, the disparity should balance out. Why Do the Rings Seem Harder? The main difference between the bar and the rings is that the rings add a stability component. 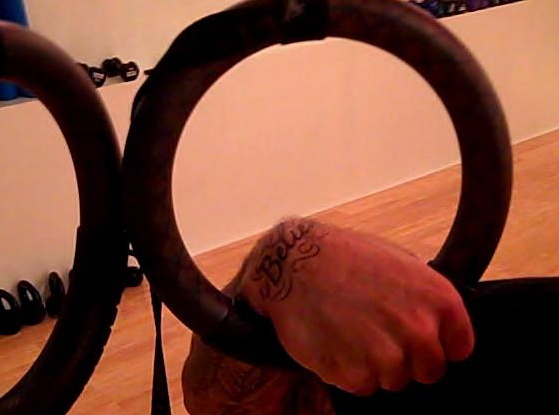 The other big difference is that because the rings are not in a fixed position, they allow you to rotate your wrists as you pull yourself up and over. While this may seem like an added challenge at first, the rotation actually makes the move less difficult. While utilizing a false grip to perform a muscle-up on a bar is helpful, using the false grip to muscle-up on rings is essential. As you pull yourself up, think about bringing the rings towards your armpits and reaching your legs forward. Once the rings are below your shoulders, begin pushing your chest and shoulders in front of your hands while rotating your wrists so your knuckles wind up pointing towards the ground. From there, simply press yourself up, just like you would if you were doing a dip. Thanks to Nimble Fitness for letting me shoot in their facility. The one arm chin-up has been my favorite feat of strength since the first time I ever saw one performed. It’s a beautiful display of strength, power and control. Anyone who can do a one arm chin-up has automatically earned my respect, for to perform this move takes discipline, patience and determination. No matter how strong you are, you simply cannot acquire this skill without lots and lots of practice. In previous posts, I’ve discussed some effective techniques to utilize while training for one arm chin-ups , like the archer pull-up and one arm negatives. Last fall I was still working towards getting a single one arm pull-up. Now, after nearly 3 years of working on this move, I’ve finally gotten to the point where I can do two in a row! Check out the video below for evidence that if you set your mind to something and dedicate yourself to it, you can make it a reality. If you’ve ever had a pull-up contest (or been asked to judge one), then you know how hard it is to ensure fairness. There are a lot of things to consider, such as technique, range of motion, hand placement, grip, etc. I’ve heard a lot of people boast about how many pull-ups they can do only to find out that what they count as a rep is barely half the range of motion. Using the dead hang pull-up is one way to make sure everyone is on the same page. A dead hang pull-up involves fully locking out the elbows at the bottom of every rep. No momentum is involved during a proper dead hang pull-up. It’s a total 180 from the kipping pull-up. I stopped by to see my brother Danny last week at his gym (he’s the personal training manager at NYHRC’s flagship location on 23rd street), and we decided to have an impromptu dead hang pull-up contest. I went first, making sure to proceed slowly and deliberately between reps. Danny went second, and seemed more focused on trying to beat my number, rather than doing every rep with total precision. Alas, I feel as though our pull-up contest ended ambiguously, but we both got a great workout, so in that sense we’re both winners. 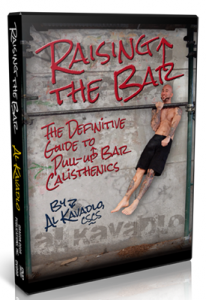 For more information about muscle-ups, pick up a copy of my book, Raising The Bar: The Definitive Guide to Pull-up Bar Calisthenics. Al Takes the 20 Pull-up Challenge! As you may know, pull-ups are my favorite exercise. So when I stumbled across the twenty pull-up challenge the other day, it was obvious to me what I needed to do. For the purpose of this particular challenge, our pull-ups will be performed using an overhand grip on the bar, the legs will be kept straight and the movement will be performed with control. There are lots of types of pull-ups, and I’m not usually a stickler, but I know some people are, so I’m hoping to avoid any confusion. A couple months ago, I issued my own 50 pull-up challenge, but this challenge is different than that one. These twenty pull-ups must be done in one consecutive set. I think that 20 consecutive pull-ups is an achievable goal for any able-bodied man out there. For women, 10 might be a more achievable goal. The potential to do incredible things is within all of us! The bodyweight row or Australian pull-up places you “down under” the bar in a horizontal position to hit your muscles from a different angle than the traditional pull-up. By hanging below a bar that is set just above waist height with your heels in contact with the ground, you’ll wind up at an angle that’s almost like an upside-down push-up. From this position, brace your entire body as you pull your chest toward the bar and be careful not to bend your hips or shrug your shoulders. 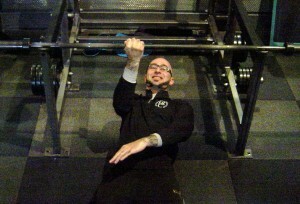 Pause briefly when your chest is an inch or two from the bar, then lower back down with control. Because it is a different plane of motion, this exercise works the muscles from a different angle than standard pull-ups or chin-ups, placing additional emphasis on the muscles of the mid-back, as well as the biceps, abs and upper-back. If you aren’t strong enough to do a pull-up, this is a great way to start to build toward your first rep. Once you can do 3 sets of 10 Aussies without struggling, it won’t be long before a pull-up is within your grasp. The higher up the bar, the better the leverage, so if performing an Aussie on a waist-height bar is too difficult for you, then start with a bar that’s closer to chest height instead. The Australian pull-up is a great exercise to use in a superset with push-ups, since they work opposite muscle groups. You will get a great pump from doing this and it also allows you to keep your heart rate up. Due to the fact that you’re allowing certain muscles to rest while you are using others, you can maintain that elevated heart rate without burning out your muscles too quickly. The Australian pull-up can also be used in a superset after the standard kind if you are trying to increase your reps on pull-ups. As you progress with this exercise, you can turn the Australian pull-up into a plyometric movement by switching from a wide grip to a narrow grip on alternating reps. You can also switch back and forth from overhand and underhand grips in an explosive fashion to further increase the difficultly of this exercise. One Arm Australian Pull-ups and More! you wind up down under the bar! 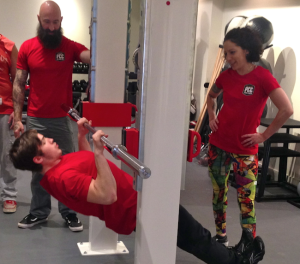 Last month I gave you some tips to get started on building up to one arm pull-ups. Here are three more tools to have in your arsenal along the way. The one arm Australian pull-up is a worthwhile exercise in its own right, though it’s never been one of my favorites. However, it can be a useful tool to help build towards a classic one arm pull-up. Since at least one leg stays on the ground, it is a little easier to perform than a regular one arm pull-up. When attempting the one arm Australian pull-up, concentrate on engaging your abs and your back muscles–don’t just focus on using your bicep strength. Remember that when you do a one arm Australian, it’s natural for your body to roll a little bit in the direction of you arm. The flex hang, which involves holding your body at the top of a pullup position, is commonly used to build strengh and endurance in the upper body. Female marines are required to perform a flex hang in order to prove themselves worthy of that title. 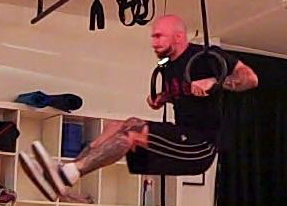 The flex hang can also be performed using only one arm. At first, I recommend keeping your legs tucked close to your body as it will allow you to engage more core strength. As you get better you can try practicing with your legs extended. Weighted pull-ups are another great way to build the strength that you’ll need to perform a one arm pull-up. Just like the one arm pull-down, pick a weight that you are only able to get around 3 reps with. Going for a one rep max on this is also beneficial, but make sure that you are warmed up first! Don’t assume that you need to be strong enough to pull double your body weight with two arms in order for it to carry over into a one arm pull. Once you can do weighted pull-ups with around 65-75% of your body weight, that will roughly translate into a one arm chin-up. It’s important to mention when discussing one arm pull-ups (of any kind) that your secondary arm does not touch your primary arm in any way. It can be stiff against the body or it can be out in the air, but if you are holding your arm or wrist you are not doing a true one arm chin. The one arm pull-up (or chin-up) is a very elusive move and requires a lot of patience, consistency, and dedication. So the question you need to ask yourself is this: How badly do you want it? Watch this video for demonstrations and more! 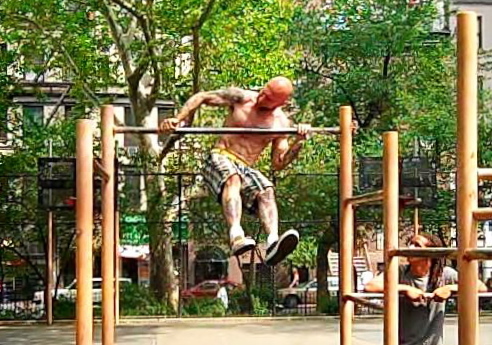 Muscle-ups are one of the most intense body-weight exercises ever. They work so many different muscles and will get your heart and lungs pumping as well. What is a muscle-up, you may ask? It’s almost like a combination of two of my favorite exercises: the pull-up and the dip, but way more intense than either of those on their own! Muscle-ups are a pretty advanced exercise so I recommend that before you even try to work up to one, you get to the point where you can do 15 consecutive pull-ups and 20 consecutive parallel bar dips. Close up of the false grip. When doing a muscle-up it is important to note that the most effective grip is different than a traditional pull-up grip. Muscle-ups are typically done using what’s called a “false grip” which involves putting your hand farther over the bar, so that your palms are facing the ground and your wrist is cocked when you are hanging. This allows you a smooth transition from the pull-up phase of the movement into the dip phase. If you want to work towards doing muscle-ups, it’s helpful to practice trying to get as high up over the bar as you can when doing pull-ups. 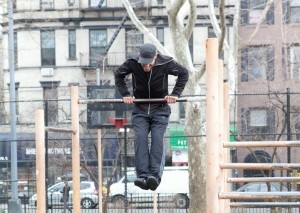 Explosive pull-ups where you let go at the top can also be used as a precursor to doing muscle-ups. When you perform a muscle-up, think about moving your upper body away from the bar on the way up rather than pulling straight towards it. 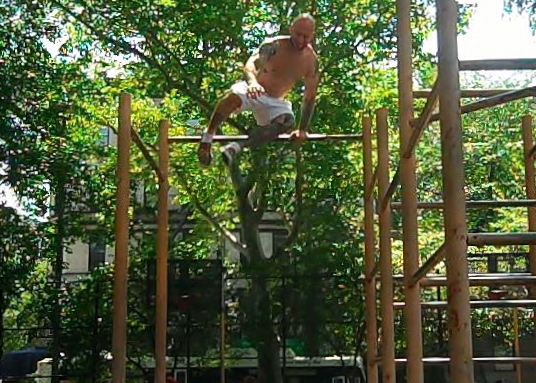 Once you clear the bar, move your chest over it as you press yourself to the top of the movement. The arc of the body will create an S-shape pattern. 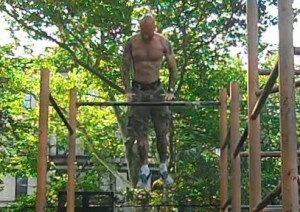 See my other muscle-up tutorial and check out the video clip below for more! 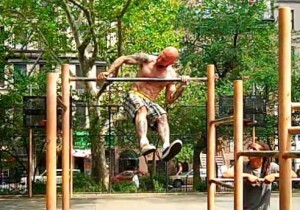 And if you’ve already got the hang of muscle-ups, check out my article on advanced muscle-ups.